Like the translation under the kanjis show, these eight kanjis represent four words but… what kanjis correspond to each word? Some words might be a single kanji long, like 日 (hi – sun); some others might be two-kanjis long, like　日本 (ni-hon – Japan); while some others might be three kanjis long, like 日本語 (ni-hon-go – the Japanese language). So how do we know which characters are part of a word and which are not? How do Japanese people split a sequence of characters – kanjis or kanas – into separate words? The process of separating a sequence of characters or sounds into a meaningful sequence of individual units (technically called ‘tokens’) is called ‘parsing’ and it’s one of the main difficulties of understanding a new language, specially when listening. The reason we pronounce words separately when we are trying to be very clear about what we are saying is to facilitate our listener the parsing of our words; we are duplicating the role of the spaces in written language with pauses in the spoken language. We start getting really good at understanding a new language, when we are able to do this parsing on the fly. Sequences of words written in either kanji or hiragana, like ‘Tokyo Medical University Hospital’ or ‘thank you very much’ are not separated and, instead, the reader must already know how to split the text, i.e., how to parse the sentence into words. It is like us reading ‘tokyomedicaluniversityhospital’ and ‘thankyouverymuch’; it’s cumbersome but doable, and with practice we would get used to it. The parsing is not perfect, though. Using multiple systems of writing does not separate ‘san’ and ‘wa’ into different words, and splits ‘nomimasu’, which is a single word, into ‘no’ and ‘mimasu’. Thus, the reader is still required to have some knowledge about the text, but now is much easier to parse the text. Usually the root of the verb is written in kanji and the conjugation in hiragana, like in 飲みます (nomimasu – to drink). Nouns are often written in kanji, but sometimes a part of a noun is written in kanji and the rest in hiragana. In a red box in the article we find the word ‘kodomo’ (children); the first character of the word 子ども (children) is the kanji 子 (ko), while the second and third characters are the hiragana ども (domo), so in spite that ‘children’ is a noun, the use of kanjis and kanas here doesn’t help us to identify the start or end of the word. Japanese doesn’t use hyphens to indicate a word is split between two consecutive text lines. 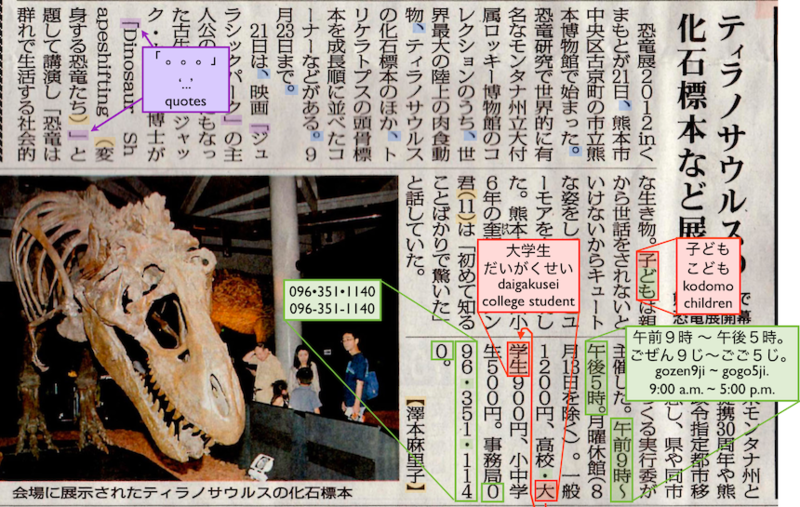 For example, in the article, the word 大学生 (dai-gaku-sei – ‘college student’) is split between two different columns but there is no punctuation mark similar to the hyphen in the first column that indicates that the word is split and it ends in the second column.